In the spring of 1993, Richard Dumas appeared to be the sort of dynamic young talent prepped to finally put the Phoenix Suns over the top. The franchise was the NBA’s latest hot thing, basking in the popularity of the southwestern suburb boom, falling behind MVP Charles Barkley and appearing set to dethrone a weary Chicago Bulls club in the Finals. 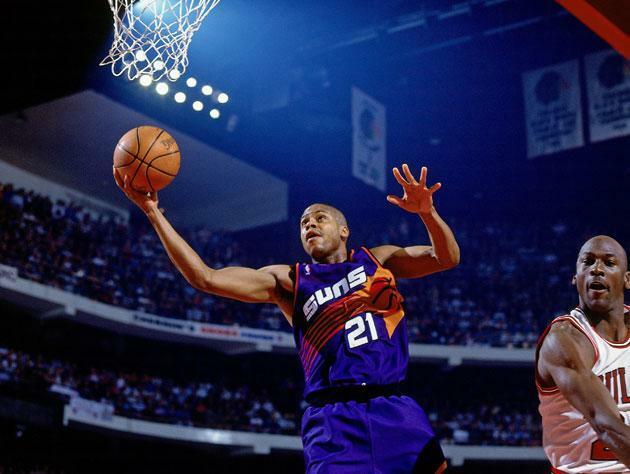 The Suns lost in six to the three-time champs, but with Michael Jordan retiring the next fall and a wide-open NBA landscape about to hit, Dumas figured to be the wing element needed to support Barkley on his way to a first NBA championship. Instead, as was the case throughout his childhood and college career, Dumas’ cocaine use got in the way of him contributing to the Suns. He’d miss the entire 1993-94 season, and be out of the NBA by 1996 as a result. His grades were fine. He never got in a fight. Dumas’ energy outlet was petty crime, busting windows and stealing candy from stores. His idle time turned him to drugs and alcohol. He said he tried alcohol at age 5 and marijuana at age 9. He blames his increased drug use, including cocaine, on former first lady Nancy Reagan. Dumas is fidgety and scattered at times in conversation but exudes an overall calm. He said he has been clean for so many years that he does not recall when he took his last drug hit. “He turned out to be a good kid until he got in trouble,” said Ted Hooks, 59, a Tulsa neighbor and friend of Dumas’ grandfather. Before you dismiss the addict for blaming others or possibly making things political, one has to understand the broad swipe of the “Just Say No” campaign from the 1980s. Drug education, a needed thing, swings both ways. A couple of generations of children from that time would have had no idea what a joint looked like, or what that rolled-up dollar bill was for if it weren’t for the “Just Say No” campaign. Nancy Reagan’s instinct was pure, as the drug culture was quickly becoming a terrifying thing by the time the 1980s hit, with a generation full of baby boomers who had become familiar with recreational drugs to an exaggerated degree now bringing children into the mix. The country needed to update the 1960s and 1970s-styled cartoons featuring pictures of syringes or pills to scare kids away from the bad stuff. So, with government funding, a lot of children and young adults of a certain time were exposed to videos and books full of color pictures depicting very specific drug use. And any parent will tell you, the minute you tell a child to stay away from something, that kid’s interest in the “something” (be it the part of the closet where the Christmas gifts are hidden, or pure Columbia flake) goes way, way up. The most frustrating part of the interview is the part where we remember – as it is once every August or so, when NBA TV replays old Phoenix Suns games – how great Richard Dumas could have been. He may not have been nor turned into “Dr. J with a jump shot,” as the excitable John Lucas (himself a former addict, and eventual Dumas coach at Philadelphia) once predicted, but Richard did put up a Player Efficiency Rating of over 18 in his rookie year. Dumas averaged 15.8 points on 52 percent shooting in only 27 minutes a game during that year, impressive numbers considering that he had been jettisoned from his Oklahoma State team two years before his rookie year because of continued drug use. Dumas didn’t make it through the summer with Phoenix, though, and was suspended for the entire 1993-94 season. He played just 167 more minutes for the Suns following the 1993 Finals, and the team (which was hit hard by a cocaine scandal in 1987) let him join up with Lucas in Philadelphia for 1995-96. From there, Coro explains, Dumas both lost his zeal for the game, while continuing to struggle with his drug issues. By the time he was arrested for cocaine possession in 1998, sympathy for coke users (a decade after its boom years) was at an all-time low. “I’m enjoying life,” Dumas said after a long pause of reflection. “I traveled the world. I’ve done what a lot of people wanted to do.